The deadline was short, and there wasn’t much text to refer to. 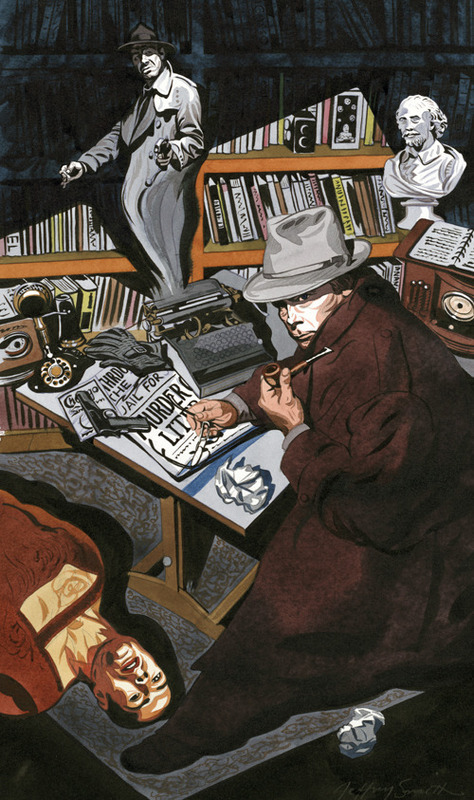 I was asked to do the assignment because I am known in some circles as a “Noir” illustrator. David wanted a portrait of Pynchon. But the portrait had to be somewhat obscure. Evidently, the media has not seen Pynchon in a very long time. This fact added to the mystique and allure of the author and his new book. I decided to focus my pictorial sights on mirrors and reflections. Mirrors are often used as a psychological force in the narrative design of Film Noir imagery. This was my way into the assignment since I didn’t have the story. As an illustrator who works on very short deadlines, I am often forced to photograph myself for reference. In other words, I am my own model. I donned one of my many fedoras, a Sam Spade trench coat, and a.45 caliber, U.S. army issue, Hell-fire handgun. I also tried using a cigar. I set 2 large mirrors next to me, one on either side. I set my Omni light low to the ground and behind me, and I shined it upwards. I shined it over my shoulder and across my face. I was hoping for rim light. Rim light is to Noir what heavenly light is to Giambattista Tiepolo. I set my camera on a tripod, well below eve-level. The eyes of the devil, or the dying, were upon me. Mirrors. I think, create ambiguity and distortion. And you don’t need a mirror to know what the mind creates. Eh? In this picture, the mirror might be a doorway, and the reflection of the main subject might be a dead guy. Or not. As for the story, well, I guess I blew that. No palm trees, or California surf culture represented here. But hell! 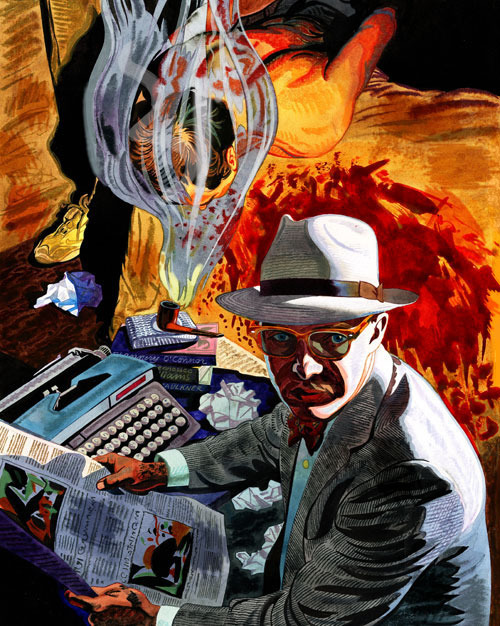 If Raymond Chandler in Los Angeles, and Dashiell Hammett in San Francisco can skip that stuff, so can I.
I decided to add several illustrations to this blog that seemed connected in some way. 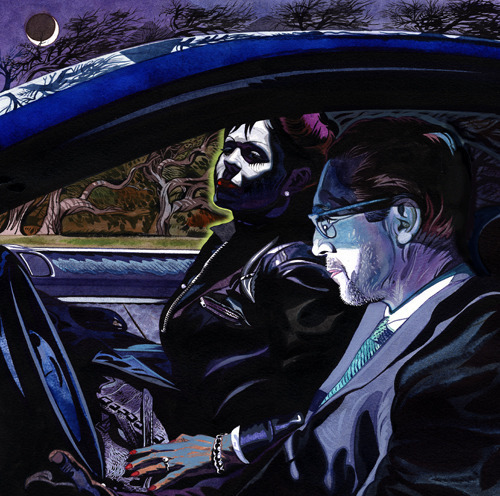 The subjects are mostly sitting, the viewer is engaged, and pictures are dark, all artificially lit. Everyone is trapped, aberration everywhere and so seemingly, all is perfectly Noir. And in the air there is the tap, tap, tapping of keys. 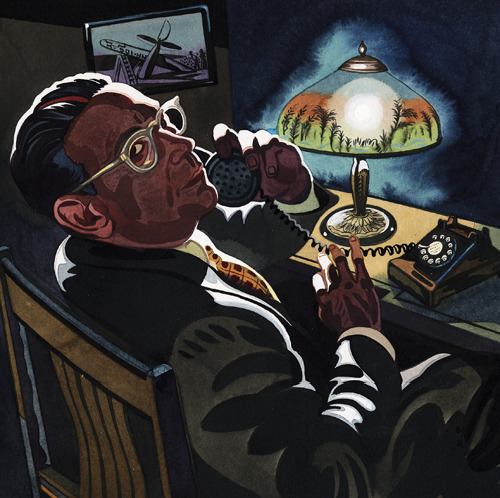 One of 22 illustrations for The New York Times Magazine, The Funny Pages, a story by Elmore Leonard titled, Comfort to the enemy, inspired by Fred MacMurray's, Walter Neff in Billy Wilder's, Double Indemnity. 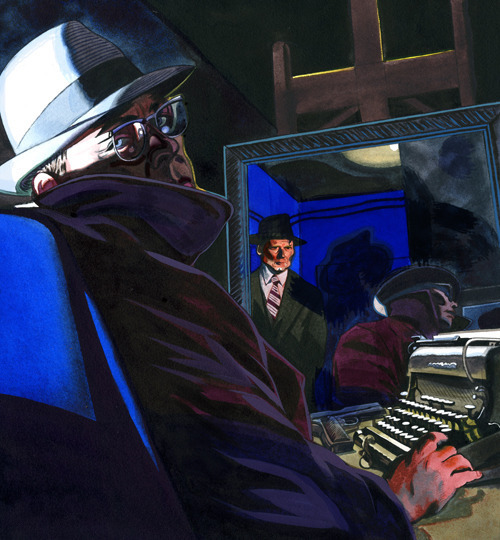 For Time magazine, a story about True Crime Writers; secretly, a portrait of a young Truman Capote. 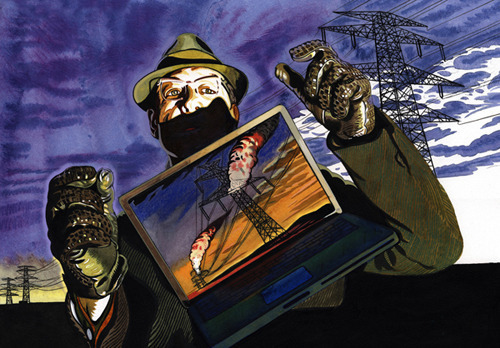 Cover illustration for The New York Times, Week in Review; a story about Cyber War.